Who is the AEGEE member of the year 2016? Which antenna, which project was the best? The Golden Times asked more than 70 locally or Europeanly active members. In this edition: read what Mareike Ritter, Gabriele Scollo, Francesca Zorcolo, Elena Efremova, Katharina Jiménez Weese and Erifyli Evangelou said. Mareike Ritter: There were several highlights for me this year: Agora Bergamo was my first Agora and I really enjoyed the atmosphere; the Summer University Heidelberg, for which I was main organizer, was intense but also a great experience; my election as NetCommie in Chișinău and last but definitely not least: the wonderful NWM Aachen. Mareike: The opening ceremony of Spring Agora Bergamo was amazing: the beautiful Donizetti Theatre full of energy and joy, the music and the excitement will be a lasting vivid memory. I also remember the motivating and pleasant atmosphere in the house during the NWM Aachen and the wonderful people I met that weekend. Mareike: Definitely Mareike Wegener, who put so much energy and time into AEGEE and did an outstanding job in the Network Commission, both as speaker and in her work with the locals. Mareike: AEGEE-Bergamo and AEGEE-Chișinău did a great job organising the Agoras this year, AEGEE-Istanbul and AEGEE-Eskişehir managed to have their SU despite of the tough political situation in Turkey and AEGEE-Aachen because they’re an antenna to look up to. Mareike: I followed the development of the Migration Interest Group and I am really impressed how quickly it grew. The IG only started a year ago and is already really involved in a lot of events and thematic discussions. But also the Civic Education Working Group is doing a really good job, having its own SU and providing a lot of content for all kinds of events. Mareike: That’s really hard to say. But I think the politically difficult situation in most of the European countries, the upcoming elections and the aftermath of the elections this year will definitely be something AEGEE should thematically deal with. EPM Zagreb will hopefully be a fruitful think-tank for that. And we all know that AEGEEans are masters at improvisation – let’s be surprised about what will happen 2017. Mareike: NetCom, NetCom, and did I mention NetCom? I am curious about what my position will bring, if I can put my ideas into practice and if I can cope with the workload. I am looking forward to meeting and working with new people, collecting memories, gaining experiences and also to developing during the year. 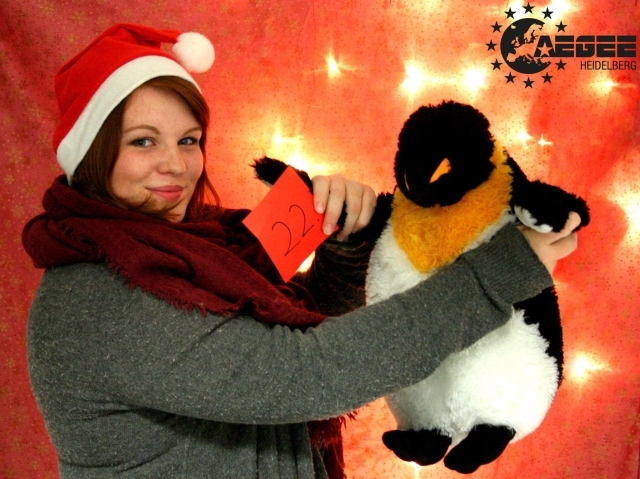 Mareike: I will get some rest and enjoy the beginning of the new year together with family and friends. “Guten Rutsch” to all of you! Gabriele Scollo: It’s very hard to just choose one, because personally 2016 was a very rewarding year AEGEE-wise. Anyway, I choose the Summer University I organized with my previous antenna, AEGEE-Firenze. We managed to reach our objective: delivering people a great experience and make them feel all our passion, which also resulted in a strong team spirit. It was also my last period in Florence before moving back to my hometown and I could not ask for a better conclusion with this great antenna that welcomed me and made me a true AEGEEan back in 2014. Gabriele: There are no words to describe the great job that was done for Agora Bergamo. During the opening ceremony my emotions were simply deep admiration and absolute love for what we do, for a moment all the city’s attention was focused on our organization. I wondered what would happen if every antenna worked the same way these guys did in the last few years. Gabriele: Svenja van der Tol has no rivals this year. She never stopped taking care of everything, showing all her dedication, enormous patience and kindness towards everyone. We definitely need more people like her to take leadership roles, because it shows our members that we are a community where everyone can make a huge difference and still not behave like a superstar. Gabriele: This is a very difficult question, because it’s impossible to know all that every local is doing. Speaking of the ones I know best, I have to mention my antenna AEGEE-Torino for organizing once every month what is probably the biggest local event in the network, the famous “Use your tongue” aperitivo, attracting every time between 700 and 1000 students! Now every student in our city has at least heard of AEGEE, I wouldn’t be surprised if they organized an Agora in a couple of years. I also have to mention AEGEE-Cagliari, which organized the best Network Meeting ever, with luxury food every day and a team of organizers that are first of all an amazing group of friends, whose passion is contagious and whose professionality is an example for all of us. Gabriele: The Civic Education Working Group worked very hard this year in order to reach out to people outside our organization with their “More than Education” initiative. Unfortunately, their online petition is stuck to a few hundred signatures and we will never reach the ambitious 1 million goal if locals and individual members don’t do their part to spread this very important cause to other partners and people outside AEGEE. Gabriele: I have enormous expectations for EPM Zagreb, both the new focus areas and the thematic part of the event about populism have what it takes to make the best out of this event. I’m particularly emotionally attached to the EPM, because it was the event that made me fall in love with AEGEE two years ago: three days in which you can have fun but also challenge your own ideas and see things from different perspectives. Furthermore, I know the guys from AEGEE-Zagreb and I have no doubt that they will take care of every detail and make your stay perfect. Gabriele: My term as a Network Commissioner has just started and it will be my main occupation for the year to come. The most important thing I want to achieve is making AEGEE more visible. Every student has to know about us and we have to insist on universities to support us much more than they do at the moment. Gabriele: I will probably suspend my AEGEE life for these Christmas holidays and go celebrate in the mountains with a bunch of good old friends. There is life outside AEGEE too! Francesca Zorcolo: We had a lot of beautiful moments this year. 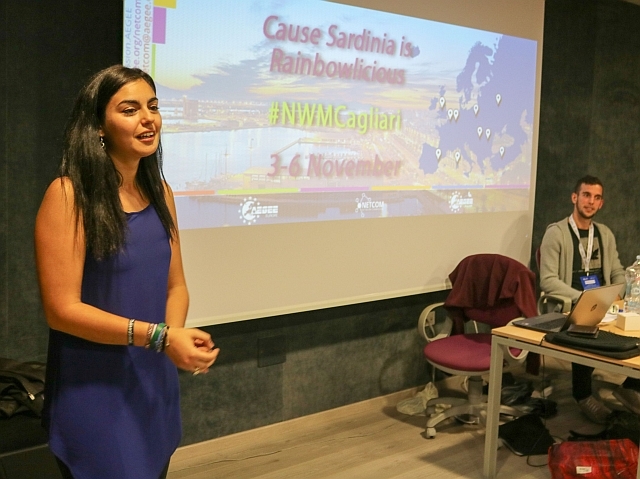 My favourites by far were when we received the notification that Cagliari had been selected for the autumn NWM, when we took our SU participants to the supermarket by night and when AEGEE-Cagliari was selected as ACTive Local of the Month in March. 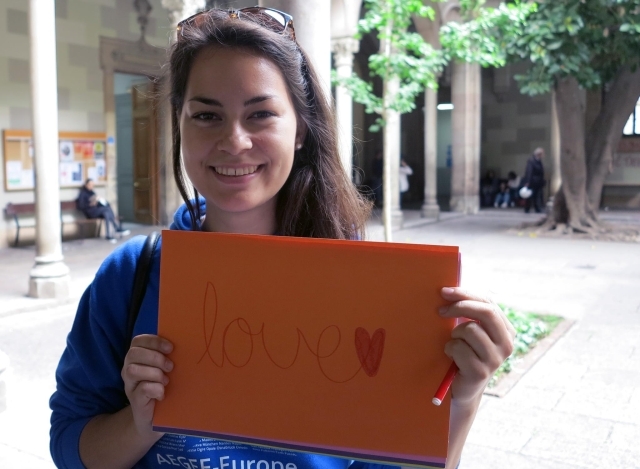 Francesca: I personally liked a lot the mobilization of the whole network for the AEGEE Day: in spite of being the first time organising a coordinated thing in the whole network, all the participating locals joined with a lot of enthusiasm and the initiative had a great impact. Francesca: Luca Bisighini from AEGEE-Brescia: this year he was Lisa Gregis’s subcommie for IT and HR, policy officer, speaker of the Migration Interest Group, member and then president of the Audit Commission and, last but not least, king of cats. He took upon his shoulders a lot of responsibilities and carried them all out successfully. Francesca: AEGEE-Leiden for organising a great EPM and also a NWM later in the same year! And all of the Turkish speaking locals because, in spite of the general situation of the country being hard and critical at times, they didn’t lose hope and went on organising events such as SUs and NWMs. I believe they are a great example to follow. Francesca: The “Your Vision for EUrope” Project, an amazing group that created the remarkable “Faces of Europe” project to tell the experiences of young Europeans and organised the conference “Borderless Europe: Blessing or Burden” together with AEGEE-Cluj Napoca. Francesca: I am really hopeful towards EPM Zagreb, I am confident the chosen topic will offer endless food for thought and inspiration to organise great things as a network. 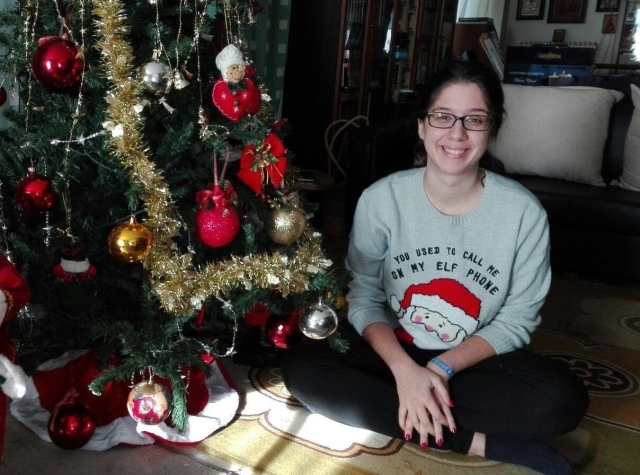 Francesca: I will attend the New Year’s event organised by the super cool AEGEE-Skopje! There is no better way to say goodbye to 2016 than being in the Balkans. Elena Efremova: My AEGEE career on the European level started! I’ve been elected as member of the Action Agenda Committee, Youth Mobility WG and then General Assistant of the Network Commission. 2016 year was full of AEGEE. Not rest at all. Two Agorae, one EPM, four NWMs, one Planning Meeting, one SU as participant and one SU as organizer – and two LTCs as a trainer: Grodno and Moscow. Sometimes, I had three Skype meetings per day with three different teams. Moreover, I am vice-president of my antenna, Kristina Reshetova’s Subcom and SUpporter. This also takes time. So, I understood how much I can work and how much I love AEGEE to spend all free time for it. Elena: The Ideas Factory in Léon. It takes place only one time every three years and it’s very important for AEGEE. I am happy that we had big and useful discussions all over network. We still continue to talk about it. The Youth Development Focus Area is a very good outcome. Elena: It will not be surprise if I name people with whom I worked. Mareike Wegener for an outstanding Speaker job in the Network Commission. Tekla Hajdu for her involvment in all processes inside ACT and the Network Commission. Moreover, Spyros Papadatos is the biggest positive surprise of 2016. He is an example for me, how a person can develop himself for time. 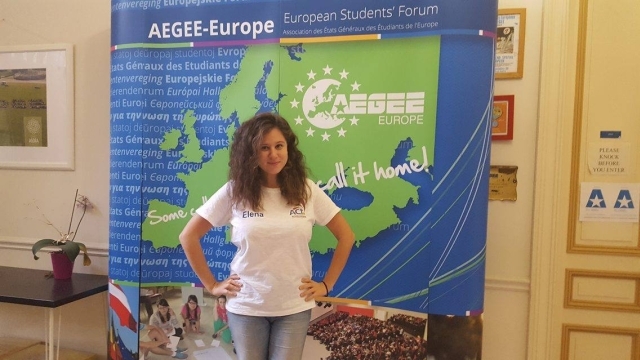 Elena: AEGEE-Chisinau! They are an example how even a small antenna can organize a big AEGEE event, that everything is possible if you desire it. Elena: Talking about Working Groups I want to nominate the Civic Education WG as the best one. They really did a lot for a whole year and became an example of how to work. Moreover, I am happy that AEGEE started the European Citizens Initiative campaign and try to ensure the EU to give Interrail tickets for the young generation. It is time that we should create history, not only talk about past achievements. And, finally, my hugs to the SUCT. You do an amazing job! Elena: I think the new Strategic Plan and the Action Agenda. Some of the new Focus Areas are not acceptable for everyone, and it will be discussed further. Elena: I want to continue to work in the Action Agenda Committee and the Youth Mobility WG. Then I want to apply for the Netcom position in Agora Enschede and organize a Summer University – believe me, it will be a great one! And, of course, help AEGEE-Rostov-na-Donu to become better. Elena: I still don’t know! Nor with whom, neither where! Katharina Jiménez Weese: I experienced another kind of highlight in my Summer University this year: the Coup d’Etat in Istanbul on 15th of July. It was indescribable and somehow scary, but AEGEE-Istanbul took care of us so that we did not have to worry about our safety. That they managed the situation so well and provided us a perfect Summer University despite all the challenges is really impressive. Katharina: I loved the implementation of the AEGEE Day, as you could see events and activities popping up in every corner of the network, all having one aim that unites us: celebrating AEGEE! Katharina: My dear friend Erifyli Evangelou from AEGEE-Athina, because of her indispensable and always reliable work as PR in the Language Interest Group, as board member of AEGEE-Athina and as ACTie in the Action Agenda Coordination Committee. Katharina: For the reasons mentioned above, AEGEE-Istanbul and AEGEE-Eskisehir deserve to be highlighted again and again. Organizing an amazing SU while in your country there is a Coup d’Etat happening is crisis management on a very high level. Katharina: I am positively surprised by all Interest Groups in general, as they are working really well, people are very enthusiastic about them and their discussions and activities are really fruitful. Personally I want to thank my Language Interest Group members who did an amazing job this year and who contributed to spreading language love all over the network. Katharina: I think Civic Education will be a big topic in 2017. Hopefully within and outside of AEGEE this topic will have an impact and I also hope the European Citizens’ Initiative will be successful. Katharina: I will be part of the AEGEE Day core team and I continue in my favourite European Body, the lovely Language Interest Group. Katharina: I have no plans for New Year’s Eve yet, but I will for sure be celebrating in my hometown. Erifyli Evangelou: My personal highlight was EPM Leiden! It was my first EPM and I enjoyed it very much! Next to that, my experience as helper during Agora Chisinau, the ACT live meeting in Brussels and the BIG exchange of AEGEE-Athina. Erifyli: The Agora of the 1000, the first super successful edition of the AEGEE Day, the new Strategic Plan, the launch of the European Citizens’ Initiative; I think we had many great moments this year! Erifyli: Andrei Dotita, the main coordinator of Agora Chișinău, for his deep commitment, efforts and endless energy! Erifyli: All the antennae that organized statutory events were amazing and they did a great and outstanding job! But for me the most wonderful antenna of the year was AEGEE-Istanbul! Erifyli: I think 2016 was the year of the Interest Groups! We saw that they can be more than just a forum for discussion and they can initiate great things. If I had to name one – I don’t know if I can be really objective though – I would name the Language Interest Group. It was awesome to see it grow and work, the members involved were really motivated, we ran many projects and tried to spread the joy of multilingualism all over our network! Erifyli: Definitely EPM Zagreb! The thematic part is extremely topical and I am really looking forward to the drafting of the first Action Agenda of the new Strategic Plan! Erifyli: I will keep on rocking with LIG and ACT and, if my timetable allows it, I am planning to attend all the statutory events. I decided to not candidate this year for the board of my local but for sure I will continue being around! Erifyli: The week after Christmas I will be organizer of our “Big Fat Greek Winter University”, but the New Year’s night, as the tradition has it, I will spend it with my beloved family, close friends and looooooooots of food!